I, like most you, upgraded to ML the other day, but since yesterday I haven't been able to send mails through o2's smtp server (It's possible the problem persisted since before yesterday - I hadn't tried sending mails in a while). First of all, I thought that it was o2's servers, but this has been disproved, because I can send mail from my iPad (latest WiFi version) without issues, either from my own WLAN, or when connecting via BT OpenZone at work. I have spoken with Apple, but unfortunately, the call got cut off cos the call centre closed, but up to that point, the techie had been helpful, suggesting option 2, above. ML works great here. All good. Did you set authentication ON on that SMTP server, like it was suggested in t'other thread? Sorry had a stressful couple of days at work, so not had much time to keep up with the threads as much as I would have liked to.. 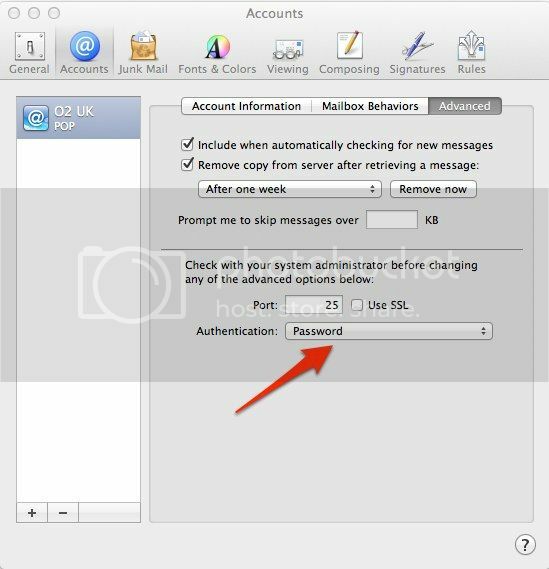 In answer to your Q: Yes, SMTP auth is set on with authentication method set to password - This was one of the first things that the Apple techie thought of asking me to do, before then going through each and every setting one by one and when that failed, testing with a new user account. Have I missed something? Are there more than 1 auth method for SMTPs? I always thought it was username + pwd. Oh, I wouldn't, not ever. You know that. Don't worry, 'Dozers, there seems to be plenty of new OS updates / name-changes, but don't worry - it's all good.